A segment leader in the mid-size family sedan market here in Merrillville, the 2016 Honda Accord gets a major update for the new model year. Both the coupe and sedan showcase more intricate and sharply creased front and rear fascias. Both body styles get new hoods. The revamped interior conveys a more high-quality look and feel usually associated with premium brands. The Accord’s exterior and interior color pallets and even fabric schemes have been revised as well. Finally, the already well-equipped car gets more standard and option features for today’s tech-savy shopper. The 2016 Honda Accord continues to be offered in coupe and sedan body styles, the only mid-size car to be offered so in the segment. Coupes equipped with the four-cylinder engine are offered in LX-S, EX and EX-L trim levels while V-6 powered ones come in EX-L and Touring. Sedan models divide in a similar fashion: LX, Sport, EX and EX-L in four-cylinder models, and EX-L and Touring with the V-6 accordingly. All come with the standard array of safety equipment: anti-lock disc brakes with brake and hill start assists; stability with traction control; a tire pressure monitoring system; and multiple airbags. 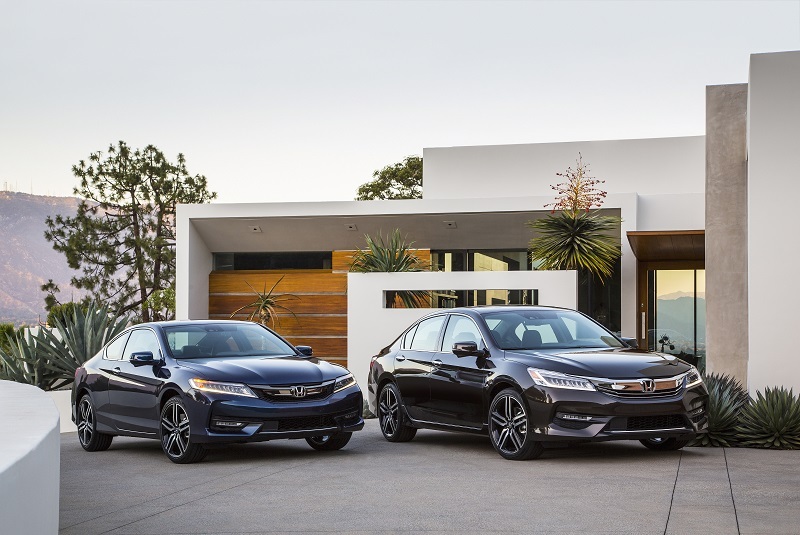 Both the Accord coupe and sedan received five out of five stars from the NHTSA in overall safety. The IIHS gave its highest rank of “Good” to both as well in most of its safety tests. Despite being the entry model into the lineup, the Accord LX sedan comes well-equipped with notable features like automated headlamps, audio and phone connectivity via Bluetooth, LED taillights, a tilt-and-telescoping steering wheel and column setup, and a rearview camera system. The LX-S coupe is similar equipped. As one rises in trim levels, the number of standard features rapidly increases. Accord EX models come with push-button ignition and power driver seats to name a few. Honda’s exclusive LaneWatch blind-spot monitoring system is also found standard at this trim level and higher. New for 2016 is the latest version of HondaLink, the automaker’s advance infotainment system. It now comes with Android Auto and Apply CarPlay for greater smartphone integration. Also new this year is Honda Sensing, which is a suite of advance safety technologies like automated braking. One of the things Merrillville Honda Buyers Love about the 2016 Honda Accord are the available powertrains. For the 2016 Honda Accord, powertrain options consist of two engines and three transmissions. The most popular combo is the 2.4-liter four-cylinder powerplant and continuously variable transmission (CVT). Output is 185 horsepower and 181 lb.-ft. of torque. Fuel economy is an EPA-estimated 31 mpg in combined driving. V-6 models paired to the six-speed automatic churn out an impressive 278 horsepower and 252 lb.-ft. of torque. Despite the extra power, fuel economy continues to be competitive at 25 mpg combined.